Nikon just announced their third rugged, waterproof Coolpix AW point-and-shoot camera. Perfect for people who like to play rough in the great outdoors, the new Nikon Coolpix AW120 has an improved 5x 28-140mm (equivalent) lens with a brighter f/2.8-4.9 aperture for better low light and action photos. The Coolpix AW120 also has Nikon’s new Hybrid VR and full HD 60i video for noticeably smoother movie recording. When I reviewed Nikon’s first waterproof digital camera, the Coolpix AW100 (read the review), it was the best rugged point-and-shoot on the market. Nikon isn’t resting on their laurels, though. Last year they followed up with the AW110, which added built-in Wi-Fi, increased the depth rating from 33 feet to nearly 60 feet, and improved the shockproofing so it could handle drops of over 6 feet. The new Coolpix AW120 has the same rugged specs – and really, why shouldn’t it? How many of us are actually going to go 60 feet underwater? The AW120 is more than capable of handling snorkeling, casual SCUBA diving, whitewater rafting, surfing, etc. There aren’t very many people who are actually capable of breaking one of these cameras. After the Nikon’s original AW100 came out, the competition turned up the heat with larger aperture lenses that capture more light for better low light image quality and better action photos. So Nikon gave the new AW120 a fast f/2.8-4.9 aperture. At the wide end of the zoom, the new lens captures twice as much light as the previous model. That’s enough to make a real difference in poor light, or if you’re trying to get a sharp skateboard or mountain bike photo. If you need more than the 28-140mm zoom, the AW120 has a new feature called, Dynamic Fine Zoom, which doubles the reach of the lens. Yes, it is a form of digital zoom but the Nikon reps I talked to assured me it’s nothing like the standard digital zoom we usually just turn off and ignore. Video in the Coolpix AW120 has also been improved. Nikon increased the frame rate to 60 frames per second, interlaced (60i). That means smoother-looking video, right out of the box. There’s also a new feature called, “Hybrid Vibration Reduction (VR),” which I was told makes “really impressive, extremely steady video.” If you’ve ever tried to record video while walking, skiing or biking, you’ll know that really is a big deal. Built-in Wi-Fi is becoming a standard camera feature now. As I said earlier, Nikon introduced it to this camera line in the previous model. But it’s worth explaining again for those who haven’t seen it and might not understand what it actually does. Basically, with Nikon’s app installed on an iOS or Android mobile device, you can wirelessly transfer photos and videos from the camera to your phone or tablet and then share them via your mobile network. The Nikon mobile app also allows you to control the camera from your phone. To see built-in Wi-Fi in action (with other cameras), check out my digital camera Wi-Fi demo video. Don’t want to carry a point-and-shoot camera and a helmet cam when you’re on your bike or the ski slopes? Nikon’s got your back. To go with the new Coolpix AW120, Nikon is introducing a new chest harness so you can use the AW120 just like you’ve use a GoPro or any other action cam. 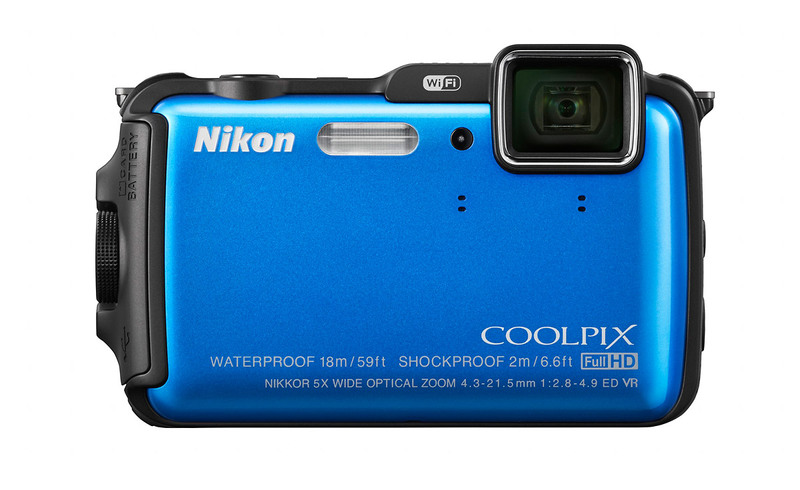 The Nikon Coolpix AW120 will be in stores next month (March, 2014). The suggested retail price is US $349.95 and it will be available in in blue (as shown, above), as well as camo, orange and murdered-out black..